Moscow, June 29, Interfax - Chairman of the Moscow Patriarchate Department for External Church Relations Metropolitan Hilarion, contrary to media claims, did not say that the question of the specific time and place of a meeting of Patriarch Kirill and the Pope has been decided, DECR secretary for inter-Christian relations Hieromonk Stephan (Igumnov) told Interfax-Religion. 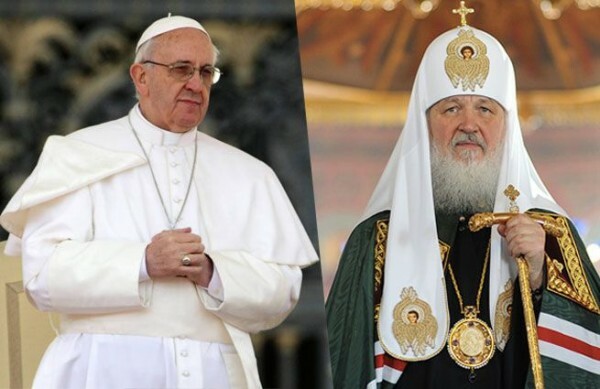 On Sunday, part of the Russian media, quoting Metropolitan Hilarion’s interview with the Italian newspaperCorriere della Sera, reported that a meeting between the heads of the Roman Catholic and Russian Orthodox Churches is possible in the nearest future in neutral territory. “Unfortunately, the publication does not quite accurately convey the thoughts that Metropolitan Hilarion expressed in the interview with the journalist of the Italian newspaper. In reply to a corresponding question His Grace gave the same answer that he had previously given in similar cases that preparations for such a meeting of the heads of the Roman Catholic and Russian Orthodox Churches proceed in working mode, that the question of arranging it has not been removed from the agenda but that no specific time or place is being discussed yet,” the church official said to Interfax-Religion on Monday. “If such a meeting does take place, it will be historic in nature, therefore the process of preparing key issues relating to bilateral relations between our churches should be thoroughly tackled so that the meeting would be fruitful to the utmost instead of being a purely protocol event,” he said.